We’re continuing our series of customer spotlight blogs that highlight the work our customers do and their unique thin film applications. In this post, we’re showcasing the thin film deposition work of Dr. Adrienne Stiff-Roberts, Professor of Electrical and Computer Engineering at Duke University. Dr. Stiff-Roberts and graduate students Spencer Ferguson and Tomas Barraza use a commercial Resonant IR Matrix Assisted Puled Laser Deposition (RIR-MAPLE) system from PVD Products in their work at Duke, which focuses primarily on thin film deposition of organic and hybrid materials. We spoke with the three of them to learn more about the strides they are making in Resonant IR Matrix Assisted Pulsed Laser Evaporation. Dr. Stiff-Roberts, what was your path toward becoming a professor at Duke University? I went to Spelman College and Georgia Tech for my undergraduate studies, getting my bachelor's degree in physics at Spelman and then onto Georgia Tech for a bachelor's degree in electrical engineering. I then got my PhD in Applied Physics at the University of Michigan. I chose applied physics because I was more interested in applied problems that would be put to use. In graduate school, I ended up working on compound semiconductor growth by molecular beam epitaxy. I was working on quantum dots for infrared photodetectors. Broadly speaking, what is your area of research? Our main goal is to use the MAPLE system to do thin film deposition of organic and hybrid materials. We're using the water to resonantly absorb the laser energy in emulsions, and by decoupling the laser energy from our target materials, we have a lot of versatility in being able to deposit organic materials in a very gentle way. The application space is pretty broad. Since I started this work, we've done things such as photodetectors and solar cells. We're starting some work on LEDs, Spencer is working on that. Spencer also looked at some two-dimensional nanomaterials that could be applied to supercapacitors. The bulk of our work, though, has been to demonstrate what it is about the MAPLE approach that is beneficial and unique that would drive other people to want to adopt this technique. It's very difficult to have the level of control for hybrid materials that exists for strictly inorganic materials, especially if you're talking about having inorganic nanoparticles that are embedded in an organic matrix. Controlling that can be very difficult. We've found that our MAPLE approach allows us to have very uniform, homogenous distributions of the nanoparticles within the film. Tomas has been working on a different type of hybrid material—perovskites. Those are interesting, because you are still combining different organic and inorganic materials, but now they form a hybrid crystal structure. These could be a new semiconductor technology that allows you to have more tailored optical and electronic properties. Because they're crystalline, you can predict material properties and you can have much better control over them compared to some of the other hybrid materials that exist. They may initially have applications in solar cells because they've had a very sharp increase in device efficiency, but they are more broadly interesting because of the wide range of properties they can possess. What type of thin film deposition system did you buy from PVD Products? We bought a commercial MAPLE system from PVD Products. The MAPLE process was developed at the Naval Research Lab, and PVD won a small business contract to develop a commercial version of MAPLE. I believe we were one of the first groups to buy that system. When I started my faculty position in 2004, I was trying to find product information through articles, papers, and searches. 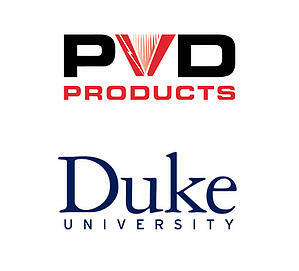 I decided on a PVD Products system, and I had it in my lab by 2006. How do you use the MAPLE deposition system in your research? We leverage the known benefits of using a MAPLE tool and we apply them to the deposition of these hybrid organic-inorganic systems together in a pretty neat way. Our work doesn't really fit with that of solution processing, nor does it fit within vapor processing. PVD’s MAPLE system allows us to turn different knobs in terms of the deposition of these materials and hopefully, down the road, enable the creation of completely new materials that can't be deposited in any other way. How did you work with PVD to develop your system? Although we bought a commercial system, there was still some customization. At the time I bought the system, it wasn’t well-known that UV lasers were not good for MAPLE so the original machine included one. PVD was willing to modify the system for me and remove the UV laser. They helped identify and procure a laser that would work for what I wanted. Soon after I got the system installed I decided that we should have a load lock on the chamber. PVD came back in and installed a load lock with a pump and made sure we had the feed-through to pass samples from the load lock to the growth chamber. One great thing about PVD having this ready-made product is the geometry of the configuration for the target to the substrate. It was much more conducive to the growth. Another feature that really made me want to buy this system was that it came equipped with the active liquid nitrogen cooling we required. PVD also already had a targeted cup that could be cooled by liquid nitrogen and they had the growth geometry in a vertical configuration. A lot of people doing MAPLE have to retrofit existing PLD deposition chambers that have a horizontal growth configuration. We didn’t have this challenge. What stood out to you the most while designing and purchasing your deposition system? This system is the workhorse for my group. Whenever we have maintenance needs, we always go to PVD first to get guidance or help. We have always gotten really great customer service from them. Their team helps us troubleshoot the issue, performs maintenance, and does whatever we need to do to keep it going. That's been one thing I've always appreciated about the company. They also gave us the ability to control some of their software. Because we wanted to do some novel things, PVD was willing to give us a deeper level of control then what is typical. They were happy to provide additional access so we could have more control over our process. The technical support is unconditional—if they're around to pick up the phone they'll sit down with you for as long as it takes to troubleshoot your problem. When we’ve experienced hurricanes here, the whole PVD Products team helped us to shut down the system. When things need replacement, the PVD guys are always there to dig up the original plans that are 12 years old. They always have the exact part number for the exact manufacturer I need to call to get a replacement. I spent 30 minutes this week with them just talking about pumps. That to me has been one of the coolest things—it's not standard to have this level of support 12 years out. To talk with one our experts about your deposition system requirements, contact our team.